process of situating Level 2 Electric Vehicle Charging Stations in local jurisdictions. The research began with an analysis of urban characteristics and EV charging and driving characteristics which could inform placement of the station along with analysis of uptake of hybrid vehicles and population densities. The resulting analysis and research formed the basis of the siting methodology. This research was carried out for the Province of BC and BC Hydro. The general approach to locating stations and the phasing of stations has been considered as a tiered network that will serve evolving objectives over time. At the beginning of the process, the main goal is to enhance visibility of the EV charging stations and to provide a basic level of service in all areas. The goal of this is to introduce public confidence, reduce range anxiety, and show support for the EV. After this first phase, more objectives come into play to bolster consumer confidence through the reliability and affordability of the network. As the network matures, a densification in more targeted areas where use is likely to be higher will become the goal. These two stages have been designated Stage 1: Geographic Distribution, Stage 2: Intensification of Key Areas. Ultimately, the goal is to form a complete network with distribution in areas where stations are expected by the public and where they are most in demand. 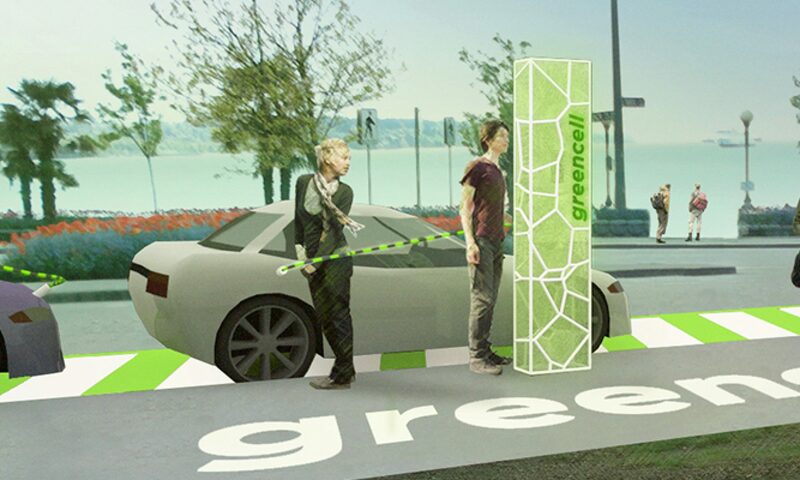 Increase the public awareness and market profile of EVs, establish high-impact branding and contribute positive urban design in station locations. Provide service in obvious, well-signed locations, ensure short wait times, and provide a simple user interface . Position EVs as progressive, green, politically aware, and innovative, building on their ability to decrease GHG emissions and their appeal as a new technology. Provide robust maintenance and service support, prioritize consistency across different types of fast-charging stations. Maintain competitive rates through early phases of adoption, i.e. rates may fluctuate to remain competitive with gas prices. Minimize installation costs through pre-fabricated or mass-customized units and standardized installation methods, work with financial institutions to provide favourable terms. Work towards financial performance on highly valuable urban land, prioritize deployment as an add-on to existing business, consider locating stations on under-utilized or under-performing sites. Ensure network robustness so that EVs are a clear alternative to gas vehicles rather than an additional mode of transport, increase market share to at least 15% of total vehicles to have a measurable impact on the purchase of gas vehicles. Continue to increase EV market share to magnify the impact of EVs which are one-to-one more efficient than gas vehicles, promote efficient driving patterns through network deployment, reduce the need for single occupant vehicles (SOVs) with emphasis on other forms of electrified transport, i.e. buses, streetcars, light rail.